My friend recently gave me a little jade plant. 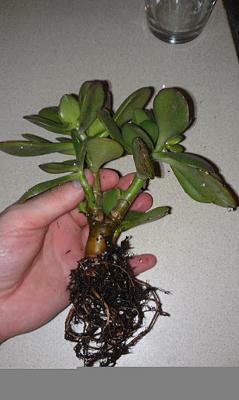 It has 3-4 different stems and is about 4" or so tall, lots of leaves, and seems very crowded. I wanted to split this plant up, keep some for myself, and give some to my mommie. What is the best way to do this? I am always nervous about the roots, I don't want to do any (or too much) damage, so I don't really know how to break them apart. As Jade (Crassula) are succulent and can create roots out of thin air on a single leaf, your fears of doing permanent damage are unfounded. These plants can survive, even without roots, so the small amount of damage that you'll do separating them is minimal. There are two schools of thought about how to do the severing: First of all, determine if these are actually joined and not just a small clump of individual plants which can just be gently pulled apart. 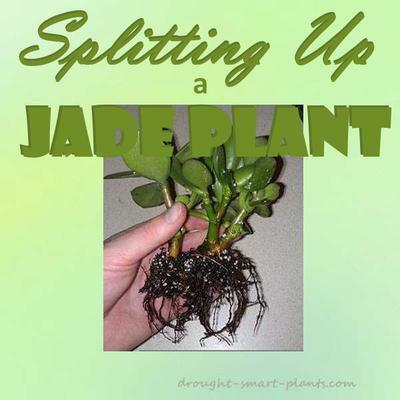 If they actually are one root stock, you can (once some of the soil is removed) see where they join, and using a sharp knife or razor blade (a craft knife works well) that you can clean with alcohol to sterilize, slice between the stems, to give each a portion of roots. The other system is to start the cut to direct it, then tear the root apart by hand, carefully. The thinking here is that this will tear between cells, leaving most of them intact (think small balloons here) instead of popping lots of them which will happen if you cut it with a knife. I've never found that it makes a whole lot of difference in the survival of the cutting or divided plant - the next step is the most important - leave the cut parts to dry, overnight or even longer. Then pot them as usual into well drained, sterilized potting soil. There you go, more plants! Have fun with your succulent collection! 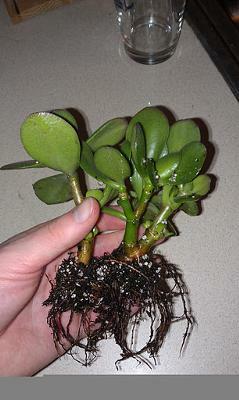 Okay, this is what remains of the small Jade plant that my friend bought me. I took your advice and rinsed the plant, removed the majority of soil so that I could split it apart. They are quite wet now, but they are separate. So now, just let them air out for a few days and then plant them? Followed by letting them sit for a week or two before getting any water? I'm happy that I am feeling more confident in my ability to do this and not worrying so much about killing the plant. You're fine! It looks like the grower planted several cuttings all in the center of the pot to make a fuller plant, so each one of the little plants will make a great individual plant now that you've separated them. Your confidence is not leading you wrong! You have the exact right method. The trick to being a good horticulturist is that you go for it, and keep close watch on the results. Each situation is slightly different and can be as subtle as what the ambient temperature and humidity in the area that you use for propagation. I'm a big believer in providing as much light as possible to newly rooting or recovering plants (not sunlight though) as light is where plants get the sugars to grow. Weird concept, I know! Your little plants will make spectacular plants, in a couple of years. They are already bushing out with more branches, so these would be good candidates for Crassula bonsai...I can hardly wait!